Yes, I know, Hunter being one is old news. But, we finally got around to throwing him a party and a baptism all in the same day. It was quite the shindig. Hunter mostly slept through it....the party that is. Before he fell asleep, he had quite the morning at church. He was the only child being baptized at mass, so it was the Hunter-show. The whole church gathered around to watch him take the plunge- quite literally. I would be lying if I wasn't freaking out in the photos below. 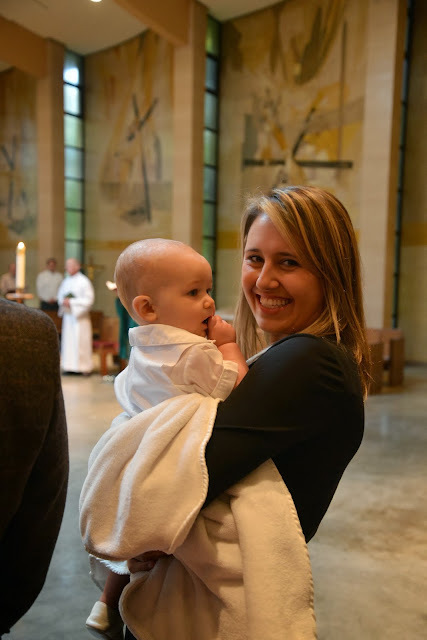 Naked baby + holy water = worried parents....because, I can only imagine that pee in the holy water doesn't go over well. He wore Chris' baptism outfit, which fit perfectly. The only down side is that it was shorts, so I wrapped him in his white blanket throughout the morning to keep his little legs warm. We are so lucky to have 2 fantastic Godparents for him to look up to. I'm sure they will be the ones he calls when he just can't deal with (us) his crazy parents anymore. He fell asleep as soon as we got back to the house, which actually worked out pretty well since I was running around getting food and drinks for our 50 guests. I did happen to snap a few photos of the decorations we used for his party. I was finally able to re-purpose this awesome old chalkboard window I made a few years ago. 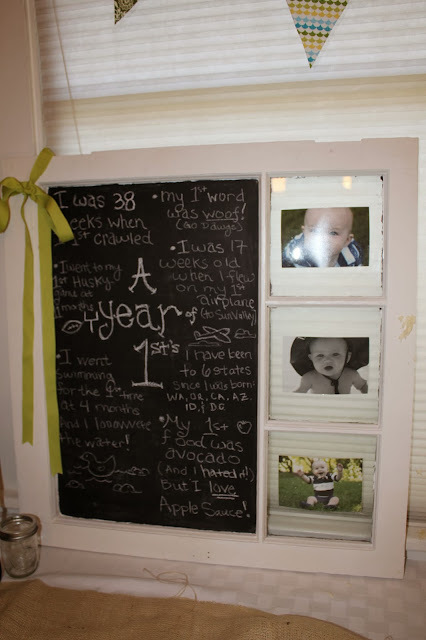 My little sister added some baby "firsts" and we used it as the backdrop for the food table. I also printed out each photo in his 52 weeks of photo shoots and posted them on our mantle. I paired that with some brown craft block letters spelling out his name. It was a crowd pleaser. As you can see, I was able to figure out what to do with all those fabrics. My amazing friend Lauren came over and helped me cut and sew all the fabric banners. I put them all over the house and the looked fantastic. I'm kind of bummed they aren't a part of our normal decor. When Hunter finally did wake up, he was too overwhelmed to eat lunch. So instead, he ate crackers and ignored his yummy vegan carrot cake cupcakes that I made him. I promise the cupcakes were yummy (I ate one). I simply used a spiced carrot cake recipe and then used egg replacer and added some apple sauce for moisture- they turned out a bit flat, but very tasty. I also whipped up some "butter cream" frosting with a dairy free margarine. Hi lack of interest in lunch and cupcakes could have been because he was a bit distracted by his cool new toys..... his own swing and ball pit. They were (and continue to be) big hits around here. He wants to go in his swing ALL. THE. TIME. Honestly, he can't get enough of it. 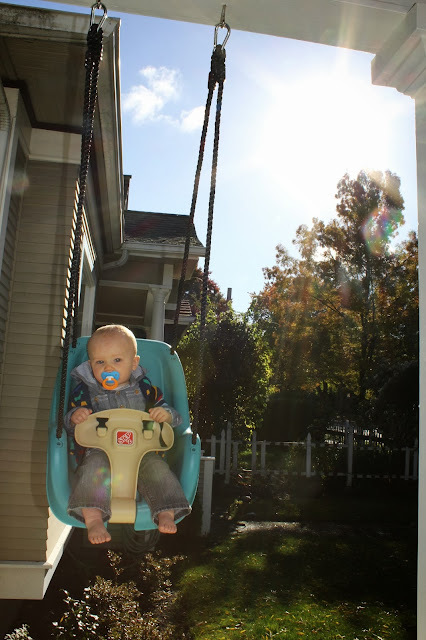 There have been many mornings and late nights, when he is already in his jammies, but we fall for his puppy dog eyes and begging requests to be put in his swing. Outside of watching him throw balls all over the house, one of my favorite parts of the party was all the gifts. Well...not so much gifts as donations. We asked that guests bring donations of diapers and formula for children in need in lieu of gifts for the boy who already has more than he could possibly want. Our friends and family are the best, they brought a TON OF DONATIONS. We went to Westside baby last week to make the donation of over 1,170 diapers- which will go to help 45 different children. I know he is too little to understand donations, but I hope to make birthday donations an annual tradition. As he gets older, he can chose the charity and what item he would like to ask for, and then all of his birthday party "gifts" will go to children in need. Don't get me wrong, he won't forgo gifts his entire life (trust me the grandparents are doing a fine job of spoiling him rotten), but I think instilling a sense of helping others at an early age is important. I hope to have a picture like this one from every birthday party- him clearly thrilled about his donations.